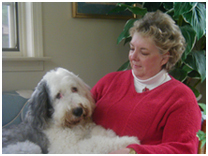 Over 40 years ago I studied all the dog breeds and came to the conclusion that the Old English Sheepdog was the breed for me. That decision has brought me years of joy. This fun loving and friendly breed brings a smile to everyone's face. My third OES was purchased from the Pickwick Kennel, she was a show puppy. Other Pickwick dogs were aquired, and become champions. I showed for several years and began breeding. I found it was the breeding that I loved. As an elementary school teacher, now retired, I have had the unique opportunity to bring these puppies into many classrooms over the years. The children, the teachers, and the puppies love it. It’s what I call a win-win situation. To read about my dogs in the news click here.